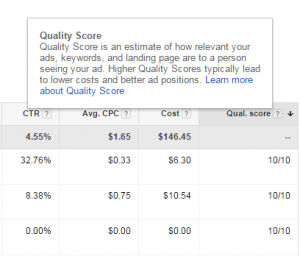 AdWords Quality Score: What Is It & How to Do You Find It? What is Adwords Quality Score & How Do You Find it? 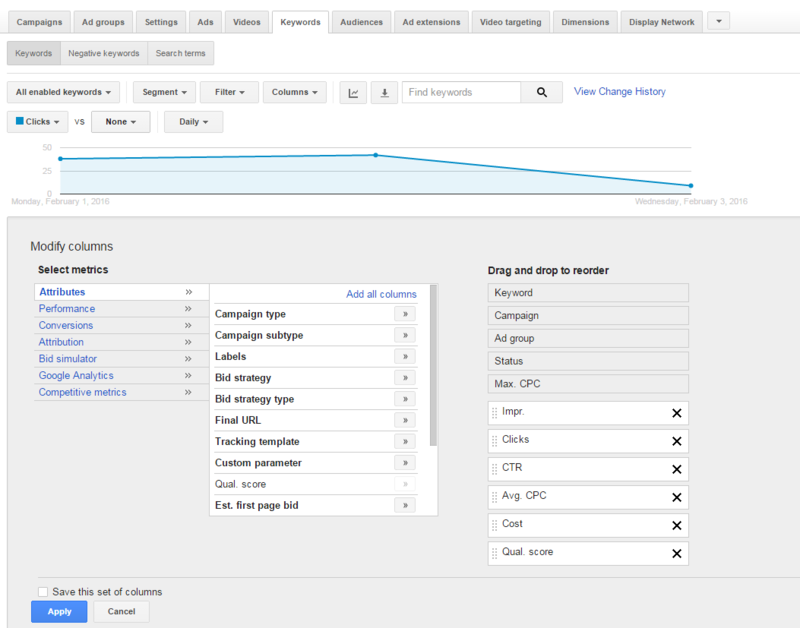 Personally, this isn’t a very clear definition – especially for those of who are less familiar with AdWords. Google’s other (and better) definition of AdWords Quality Score is “how relevant your ads, keywords, and landing page are to a person seeing your ad”. On a scale of 1-10, the higher your Quality Score, the more relevant your ad, landing page, and keyword are to each other. AdWords Quality Scores are assigned at a Keyword level. Each Quality Score is based on three components – Expected Clickthrough Rate, Ad Relevance, and Landing Page Experience. To learn more about these components read our post on what affects keyword Quality Scores in Google AdWords. On your Keywords tab, click Columns. Under Attributes, add score to your set of columns. PrevWhat’s the Difference Between Long Tail & Broad Match Keywords?